Mustered Courage - Run to Paradise. 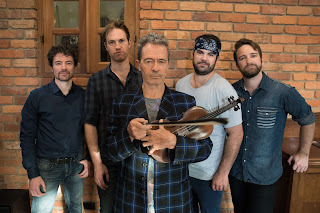 Background - Golden Guitar Award winner and ARIA nominated Melbourne four-piece, Mustered Courage, have well established themselves in the forefront of Australia's folk and roots scene. Known for pushing the boundaries of what progressive folk-rock can be, they convinced prolific rock and roll songwriter, performer and Choirboys founder/singer, Mark Gable to record and perform 'Run To Paradise' with a bluegrass twist. The result gave the song a new lease on life engaging an entire music community that may not be so familiar with the song first made famous in 1988 by Choirboys. After a chance meeting in the main street of Tamworth during 2012's Country Music Festival, with Mark introducing himself and praising the band for their work, never did the pair think it was the start of a magical music collaboration. "Being a young band and our first ever trip to the Festival, it really meant a lot to us," says guitarist Julian Abrahams. The pair continued to cross paths for many years in Tamworth and in 2014, the band managed to convince Mark to join Mustered Courage on stage at one of their Tamworth shows to perform a bluegrass arrangement of Gable's successful single. Needless to say, Mark was all in and the audience were in raptures. "The chord progression lends itself very well to the traditional bluegrass sound so it made a lot of sense and Aussies love this bloody song and we loved delivering a version that the country and bluegrass people could get into as well. That audience absolutely brought the house down after we played it with Mark." This is the band's first new recording release since 2015 and leads the way for a new album release in September 2018. Keen to involve fans in the band's next recording venture, Mustered Courage will begin a crowdfunding campaign via their official website in the coming weeks. "We have such a ball spending time with Mark and the music video was an absolute hilarious blast to shoot. His energy and sense of humour is second to none, and what a voice," says Julian. "Mustered Courage fans are no strangers to us doing left of centre cover versions, so we think this should be a nice addition to our repertoire. Maybe even a new country anthem that opens the doors of Aussie rock fans to a genre they don't yet know they love. Time will tell... bluegrass paradise". WEBSITE. Featuring Choirboys Mark Gable 'Run To Paradise' is my first taste of Mustered Courage and boy is it a good one! That the song brings bluegrass to a broader audience is a bonus, as this feisty and vibrant piece mixes some superb musicianship with natural sing along vocals, in a word, class. Claude Munson - Broken Stairs. Background by Claude Munson - Whether drenched in crystalline synths or stripped bare, I aim to write songs that tackle modern life and love with radical intimacy. This week“Broken Stairs” is about wanting to run away but having nowhere to go. I’m singing about questioning my past and reflecting on mistakes I made. As that happens, I begin to feel the need to break out and escape reality. In that state, I ask myself to be aware of the people around me and myself. It is a personal lesson about the enticement of love and detaching yourself from love when it does not prevail. We chose the concept of getting lost in your own city for the “Broken Stairs” video. I was inspired by teenage memories of walking and hiking around Ottawa and Hull with my friends. We would go out and discover graffiti walls, and abandoned things like the old train tracks that cross the Ottawa river and bridge Ontario and Quebec. marks the release of The Silence Came After via Ottawa's Record Centre Records, my second and most fully realized album to date. Produced by Scattered Clouds’ Philippe Charbonneau and engineered by Sebastien Perry, The Silence Came After is equal parts lush and spare, marrying the naked soul of 70's era Neil Young with Talk Talk’s spacious expressionism, and Krautrock's motoric rhythms. 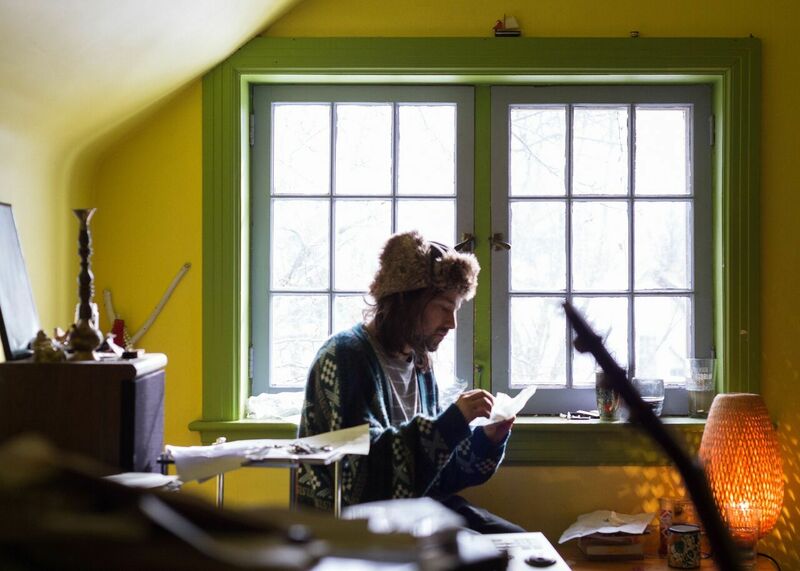 The record also features members of Little Scream, Scattered Clouds, Bosveld, and FET.NAT. TWITTER. 'Broken Stairs' s a fresh sounding indie folk song with some notable and distinct vocals adding passion to a fast flowing and catchy musical backdrop.